Crosscut paper shredders deconstruct paper in a multidirectional manner, producing very small particles of paper that once shredded are impossible to read. Information on documents are randomised to a standard where even careful reconstruction becomes virtually impossible. These paper shredders are not new to the market and until recently were very expensive to purchase and almost exclusively used within defence forces and high levels of government. Now days however, cross cut shredders are easy to purchase by all consumers and at very reasonable prices compared to years gone by. 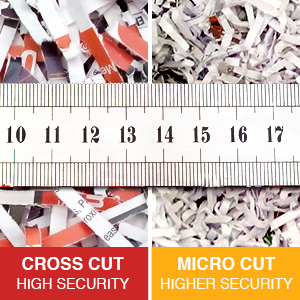 The most obvious benefit of cross cut shredding is the high security of information once shredded into many particles. The most alarming concern when looking at strip shredded paper, is the very likely possibility of print being shredded in the same direction as the shredded paper strips. In this example full lines of print are easily identified. The risk of an information leak is far greater when using a strip cut paper shredder which is why Shredder Sales considers strip cut paper shredders as obsolete for the purpose of shredding confidential information. There are several variants of cross cut shredders which all shred the same way but into smaller particles, these are known as “Micro Cut” & “Super Micro Cut” shredders. Many brands of office shredders are available in all shred types; Strip Cut, Cross Cut, Micro Cut and Super Micro Cut. 1: Cross Cut Shreds require only 25% of the volume of strip cut shredded waste. 2: Greatly reduced emptying, usually 1 cross cut empty for every 4 strip cut empties. 4: Reduced environmental impact using far less shredder bags. 5: Reduces waste disposal costs. When emptying your shredder, full bags of cross cut paper are heavier to lift. It is considered that a full 100 litre bag of cross cut shredded paper is manageable to carry without impacting workplace OH&S guidelines and obligations. Security of paper once shredded is generally categorised into 7 security levels according to the DIN’s standard 66399. In the context of shredded paper, the DIN has developed the “P” category reflecting the security of shredded paper. DIN represents the national interests of Germany and Europe and throughout the world. DIN’s aim is to develop standards that have validity worldwide including the measure of security levels for "Office Machines - Destruction of Data Carriers". Most shredder manufacturers include the relevant DIN security specification on their websites, product information brochures and marketing material reflecting the DIN 66399 security level according to the device.